The owners Francesco and Caterina Trofa, together in life and job, delight own customers with a tasty and genuine cuisine, rich in ancient flavours and refined perfumes. The restaurant has a welcoming hall inside and a wide terrace. It's possible to taste our specialities at lunch, admiring the crystal sea of the splendid bay of Citara, and at Dinner in front of wonderful breathtaking views. The menu is based on the daily catch and the period. 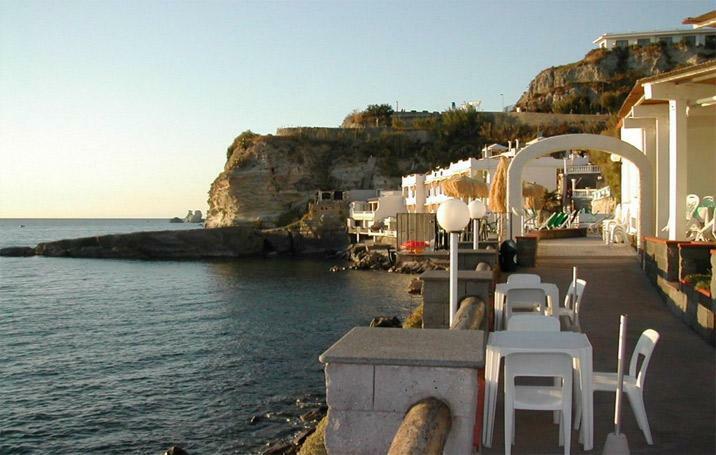 A wonderful terrace above the bay of Citara, slamm indoor parking, cosy to reach by car or bus, very nice even if long the walk which links the restaurant to the nearby municipality of Forio.